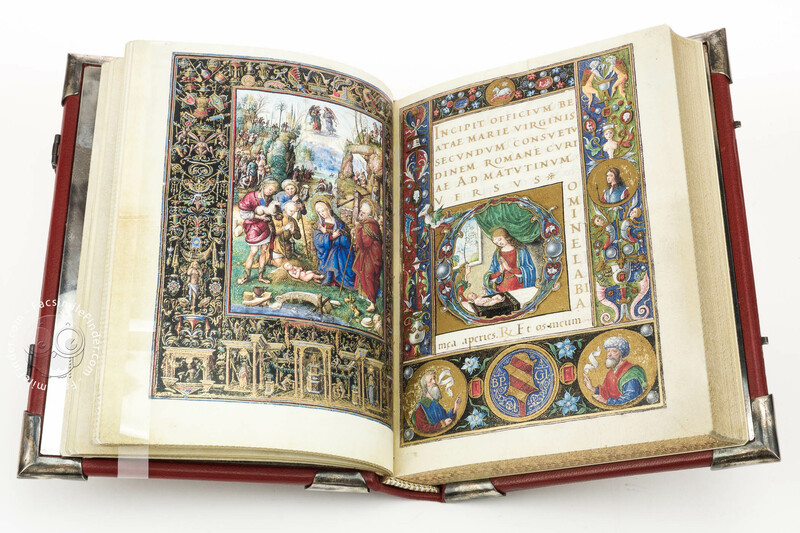 Bonaparte Ghislieri, a member of a leading family of Bologna, commissioned this Book of Hours around the year 1500. 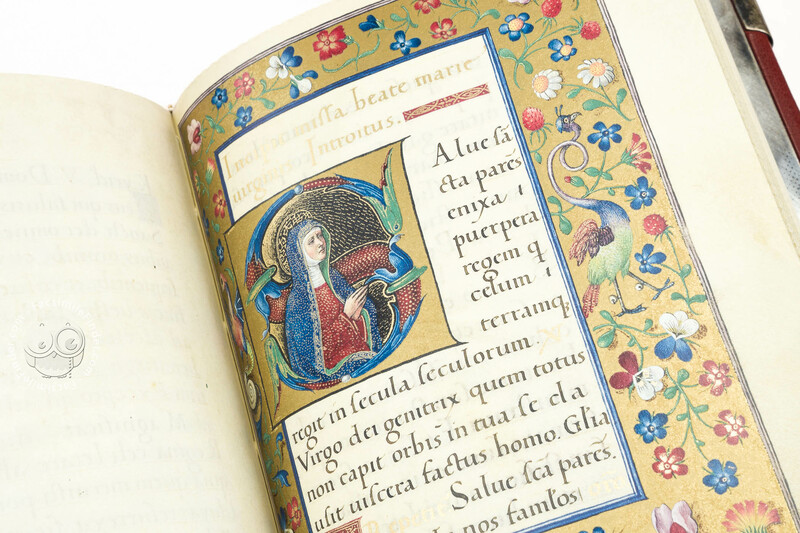 This devotional manuscript displays an elegant Humanistic script written by the hand of Pietro Antonio Sallando, who was a calligraphy master and a grammarian at the University of Bologna. 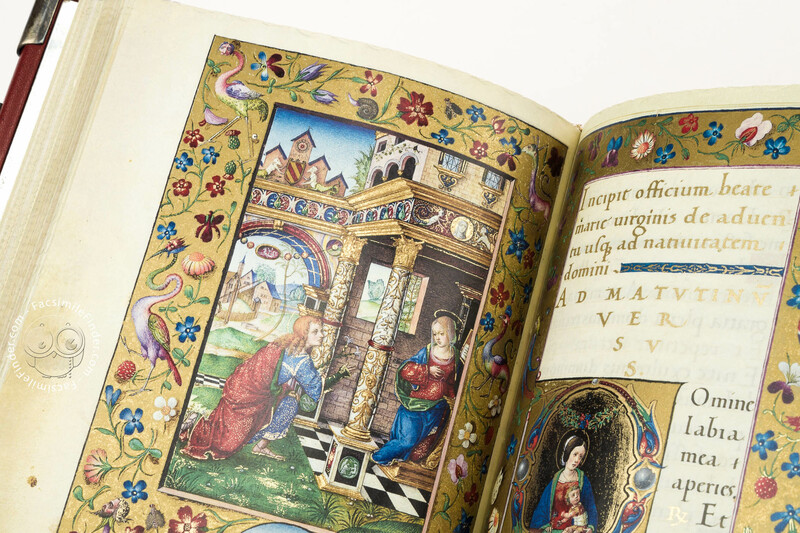 The exceptional quality of the manuscript is due to the renowned artists and scribe that realized it. The original owner Bonaparte Ghisleri was elected senator in Bologna in 1523, right after the tragic assassination of his father. 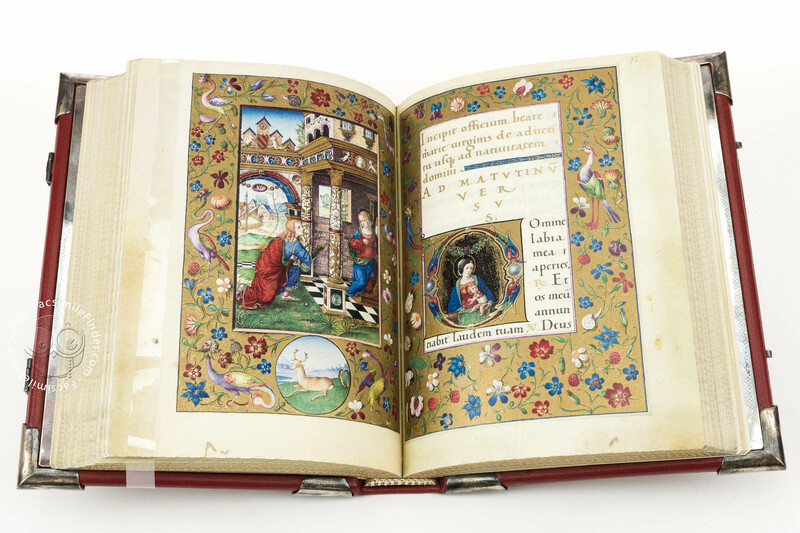 When the manuscript was made, Bonaparte Ghisleri was a young man and it is possible that Bonaparte’s father commissioned this codex for his son. 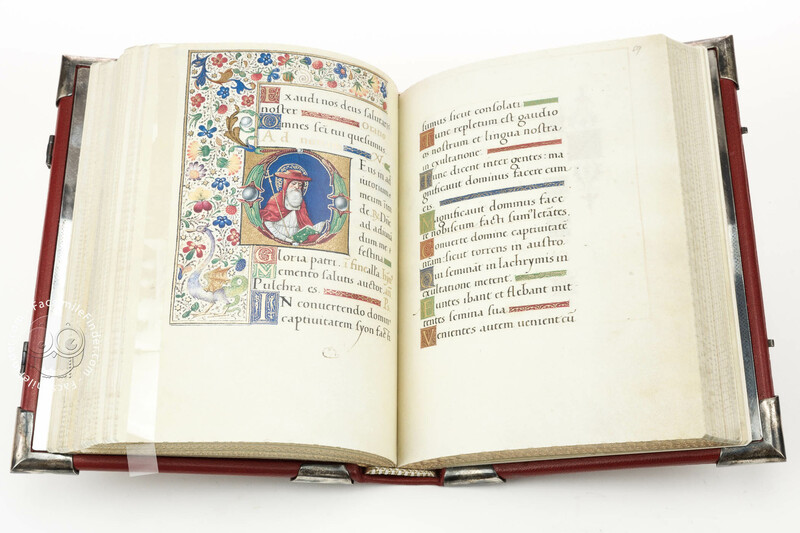 From the hands of the Ghislieri family, the codex passed on to the Albani family of Urbino. In 1897, Henry Yates Thompson bought the manuscript and brought it to Britain, where it is now preserved in the British Library. 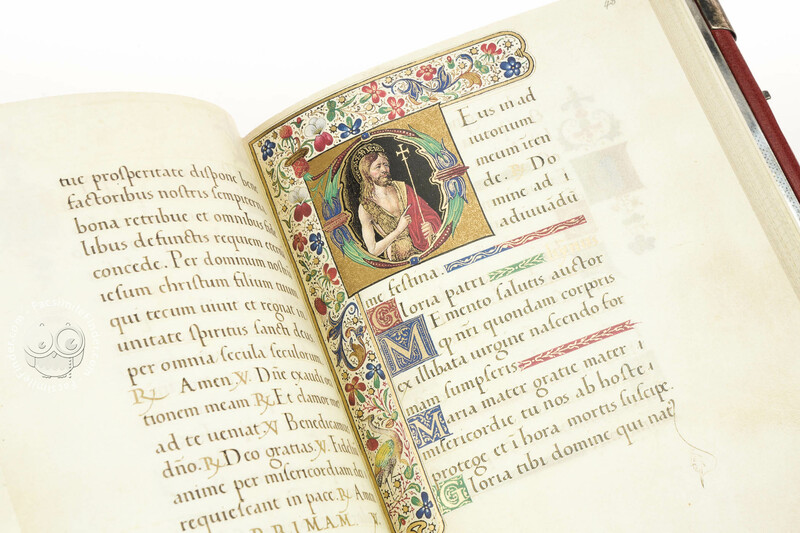 Ghislieri wanted to collect in this book a series of works of art made by famous artists of his time. 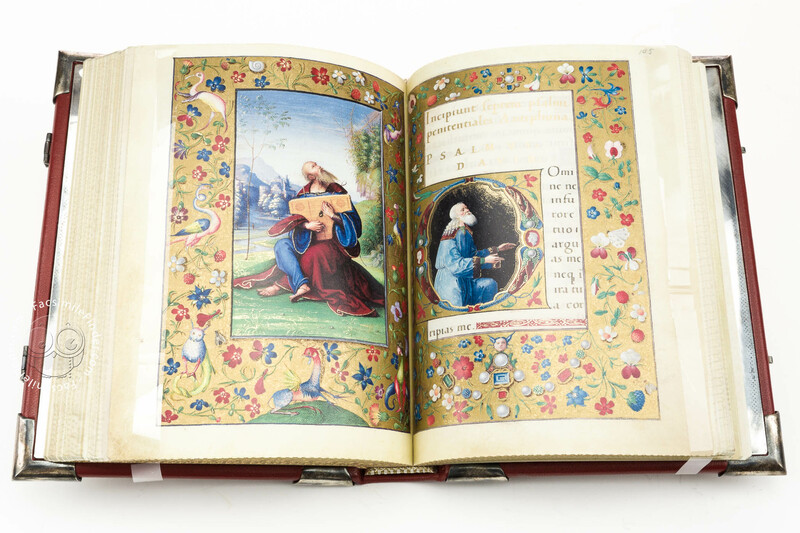 Each one of the artists that he selected realized a full-page illumination to be incorporated in this precious manuscript. 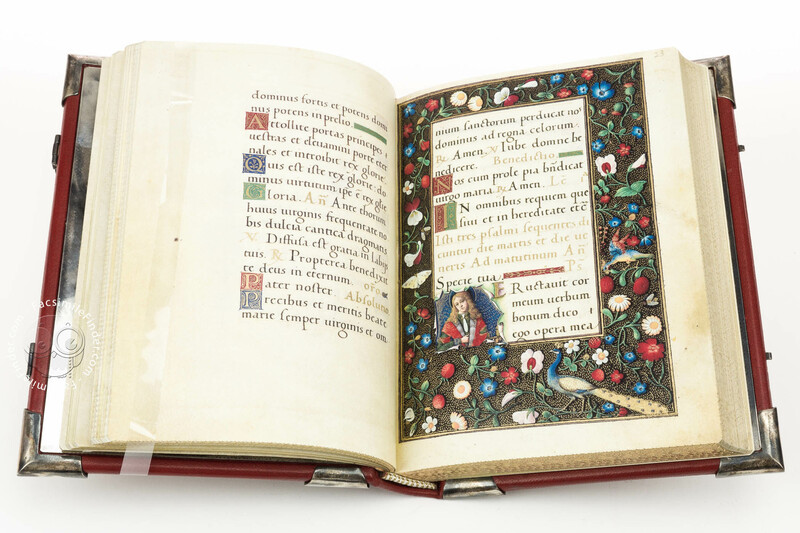 The Book of Hours encompasses miniatures of artists active in central and northern Italy, who signed the individual pages that they decorated. Amico Aspertini painted the Adoration of the Shepherds (fol. 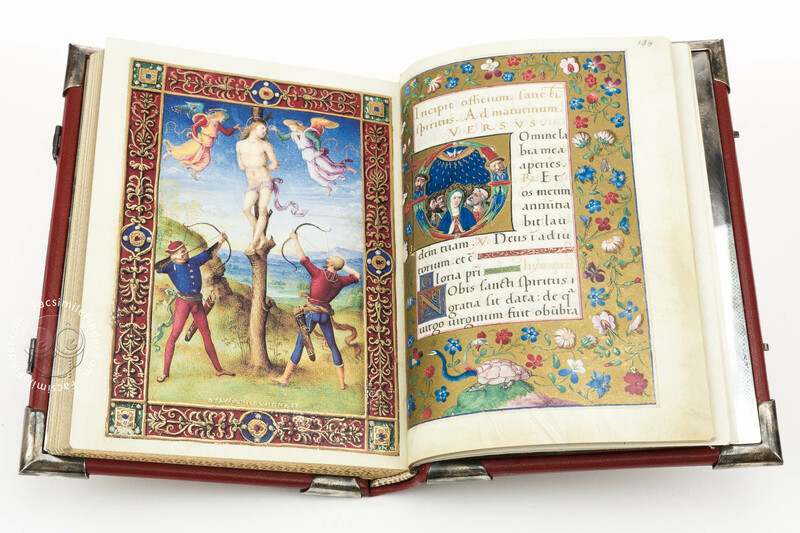 15v), Pietro Perugino the Martyrdom of St Sebastian (f. 132v), Lorenzo Costa realized David with the Lyre, Francesco Francia St. Jerome in the Wilderness (fol. 127v), and Matteo da Milano the scene of the Annunciation (fol. 74v). 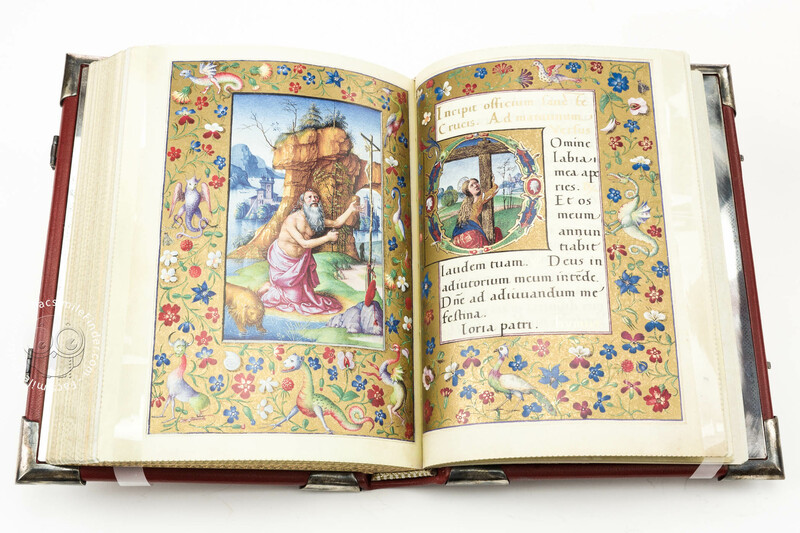 The full-page illuminations are embellished with decorated borders inspired to important archeological sites. The ornament that appears in the margins of the illuminations reproduce floral and zoomorphic motifs influenced by the decor of the ‘Grotte’ (caves) of the Esquiline Hill in Rome. The Esquiline Hill was the place where the remains of Nero’s Domus Aurea (Golden House) were uncovered in 1480. 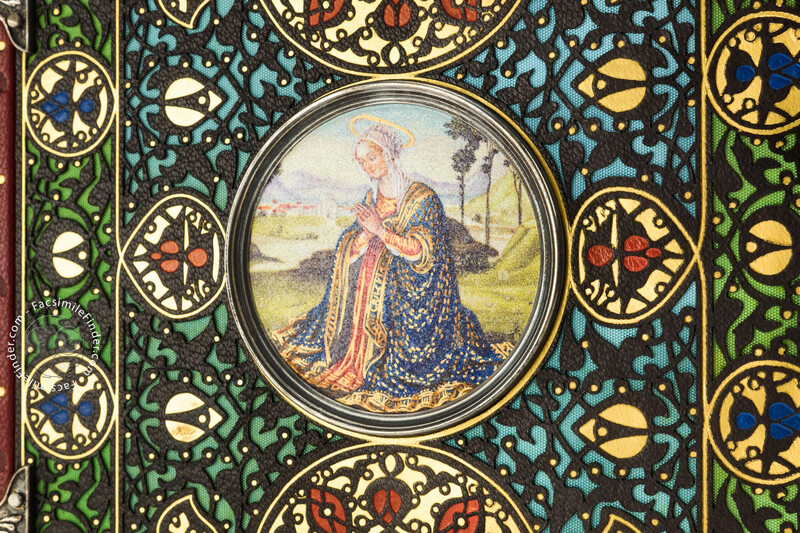 The findings of ornamental elements in that site highly influenced the artists of the Ghilslieri Book of Hours. 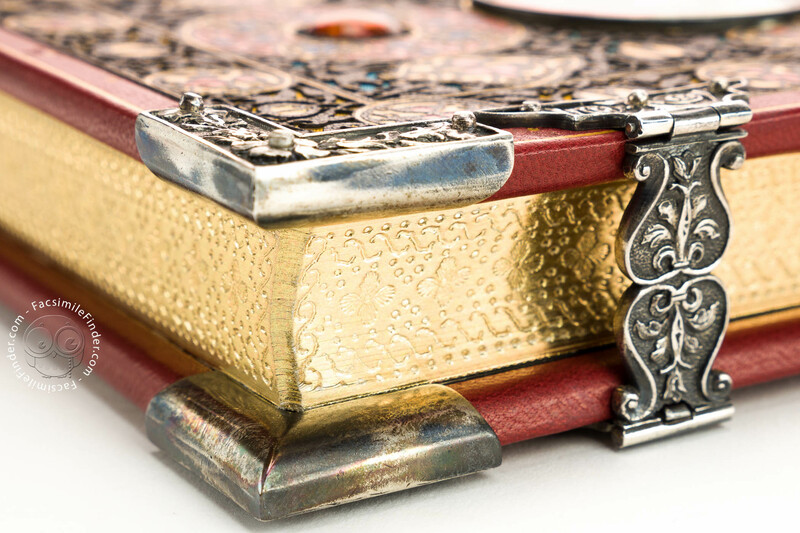 The binding is remarkable because of the quality of its execution. 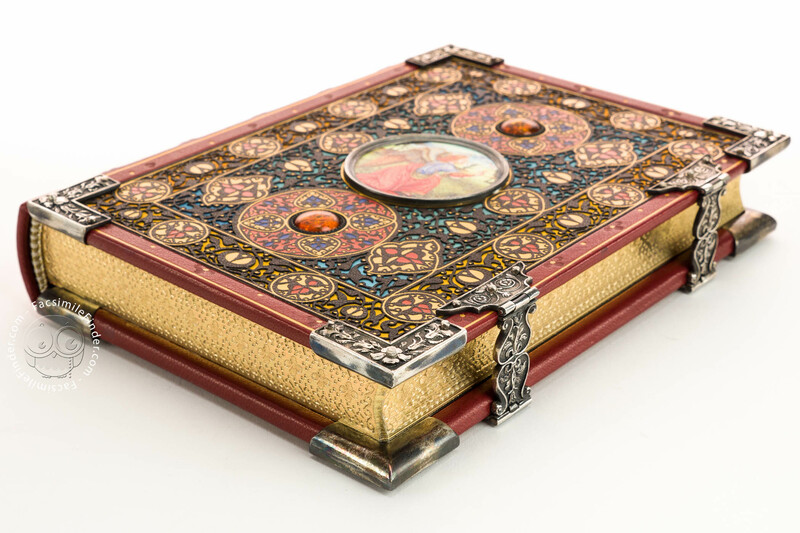 It is made of morocco leather decorated with floral patterns on colored silk. Two semi-precious stones embellish both covers. 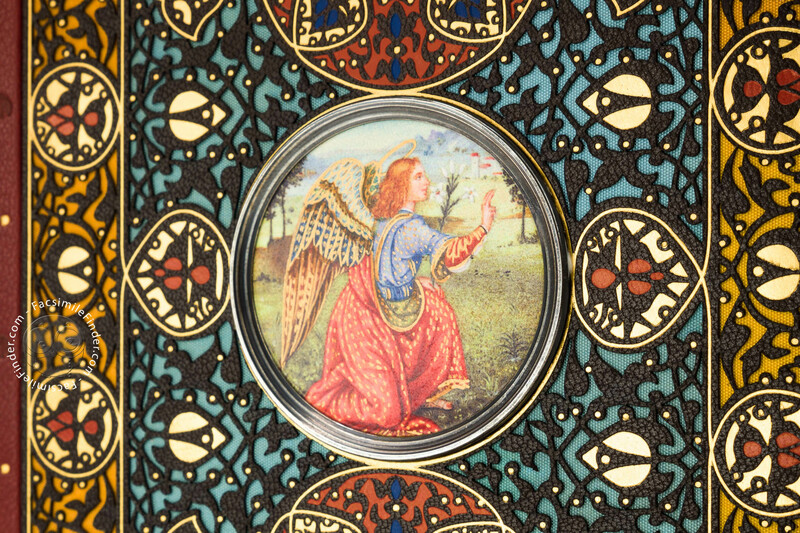 Each cover shows at the center a roundel featuring the figures of the angel and the Virgin, respectively. 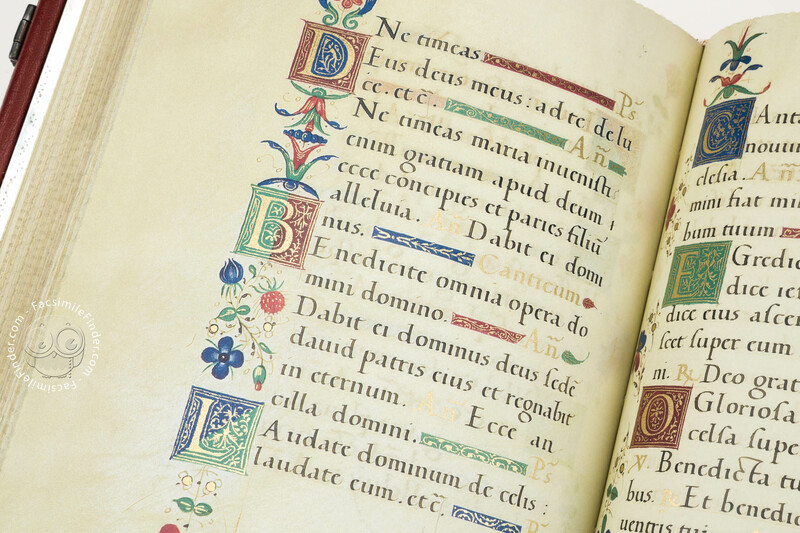 Manuscript book on parchment − 20.7 × 14.5 cm − 274 pp. Full-size color reproduction of the entire original document, Book of Hours of Perugino: the facsimile attempts to replicate the look-and-feel and physical features of the original document; pages are trimmed according to the original format; the binding might not be consistent with the current document binding. 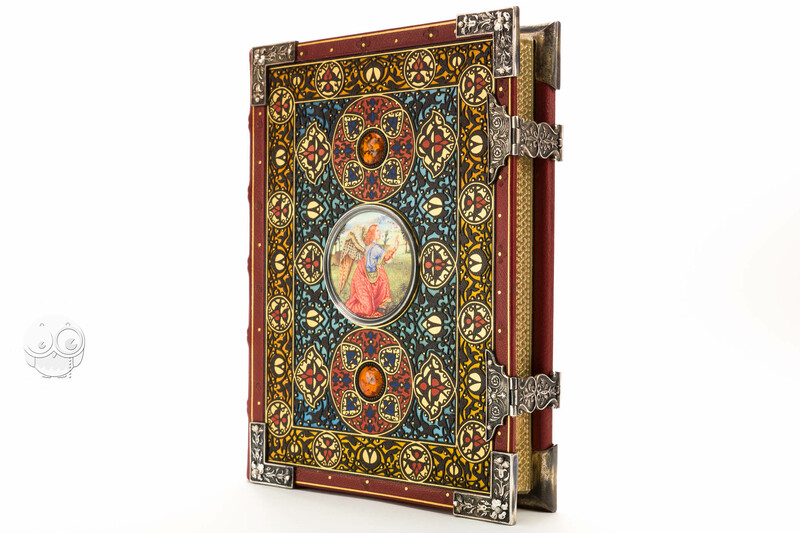 Morocco binding adorned with silver and enamel work and semi-precious stones.